This menu includes submenus to Add Income/Expense and Edit Income/Expense. 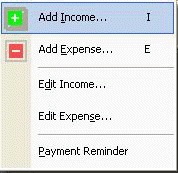 Various submenus are shown in Figure D. Before adding Income or Expense in a Category, you should once add this Category in Add/Delete Category window. You can take it from program interface, ie. Icon with blue square. 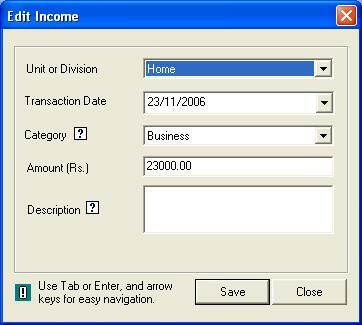 19) Add Income: This accepts Income details from the user. Entries for Unit/Branch/House, Income Category, Transaction Date, Amount, and Description/Keyword can be made here. Make sure you have added required Income Category once in the Add/Delete Category window. You can take Add/Delete Category window from program interface, ie. Icon with blue square. Add Income window is shown in Figure 18. While adding Income, you may use Tab/Enter and Up/Down arrow keys for selection. Instead of selecting items in the combo box using Mouse pointer and Up/Down arrow keys, you may type starting letters on the keyboard to display each. During continuous entries, Tab/Enter key may be used repeatedly if you need cursor to be on the Amount typing space. After entering Income particulars, if you click Add button or press Enter key, it will be added to the Income list and will give you chance to add another Income. 20) Add Expense: This is similar to Add Income option. This accepts Expense details from the user. Entries for Unit/Branch/House, Expense Category, Transaction Date, Amount, and Description/Keyword can be done here. Make sure you have added required Expense Category once in the Add/Delete Category window. You can take Add/Delete Category window from program interface, ie. Icon with blue square. 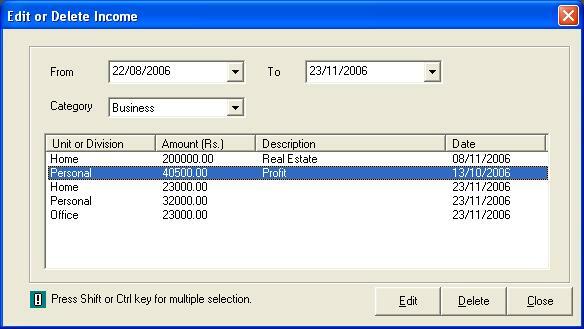 Add Expense window is shown in Figure 20. While adding Expense, you may use Tab/Enter and Up/Down arrow keys for selection. Instead of selecting items in the combo box using Mouse pointer and Up/Down arrow keys, you may type starting letters on the keyboard to display each. During continuous entries, Tab/Enter key can be used repeatedly if you need cursor to be on the Amount typing space. After entering Expense particulars, if you click Add button or press Enter key, it will be added to the Expense list and will give you chance to add another Income. 21) Edit Income: This option allows you to Change or Delete Income details. Edit Income window is shown in Figure 21. When you select the Category that you want to Edit or Delete from the combo box, all the relevant entries in different Unit/Branch/House will be displayed. If you select an entry from the list and click Delete button, confirmation message box will appear and then selected entry can be deleted according to your response. You can select multiple entries by pressing Ctrl or shift key and can delete, if you require so. If you click Edit button, another window will appear as shown in Figure 22. In this window, you can change Amount and Income Description/Keyword. Then click Save button. If you click Close button without clicking Save button, there will not be any change in the Amount and Description. 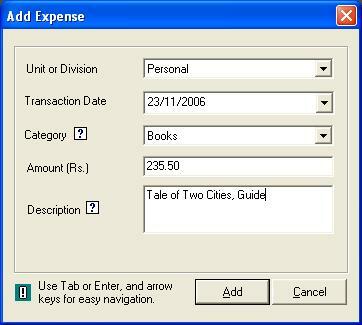 22) Edit Expense: This option allows you to Change or Delete Expense details. Edit Expense window is shown in Figure 23. When you select the Category that you want to Edit or Delete from the scroll down box, all the relevant entries in different Unit/Branch/House will be displayed. If you select an entry from the list and click Delete button, confirmation message box will appear and then selected entry can be deleted according to your response. You can select multiple entries by pressing Ctrl or Shift key and can delete, if you require so. If you click Edit button, another window will appear as shown in Figure 24. In this window, you can change Amount and Expense Description/Keyword. Then click Save button. If you click Close button without clicking Save button, there will not be any change in the Amount and Description. 23) Payment Reminder: This option helps you to remind the payment details with payment date, amount to be paid etc. between a particular period of time. Payment Reminder window is shown in Figure 25. You can Add new payment reminders by giving details to the Add Payment Reminder window which pops up on clicking the Add Reminder button. The Add Payment Reminder window is shown below.